Oil climbed after a record run of losses as Saudi Arabia said OPEC and its allies should rein in output, with the kingdom itself reducing shipments by about 500,000 barrels a day. Futures in New York rose as much as 1.8 per cent, after slumping into a bear market last week. Saudi Arabia said that oil producers need to cut about 1 million barrels a day from October levels, and that it’ll reduce exports by half that amount next month. The Saudis are taking the lead to counter a price slide of about 20 per cent over the past month, which reflected surprise U.S. waivers for some buyers of Iranian oil, as well as signs of an emerging glut in America. That potential surplus suggests the impending Saudi cut won’t make a big dent in supply and explains why Monday’s price gain isn’t steeper, according to consultant Petromatrix GmbH. “If it’s a cut of half a million, it’s not that much considering the increase from the U.S. and considering the global balances that we have for next year,” Petromatrix Managing Director Olivier Jakob said by phone. West Texas Intermediate for December delivery rose as much as US$1.09 to US$61.28 a barrel on the New York Mercantile Exchange, and traded at US$60.93 as of 8:39 a.m. local time. Total volume traded was 72 per cent above the 100-day average. 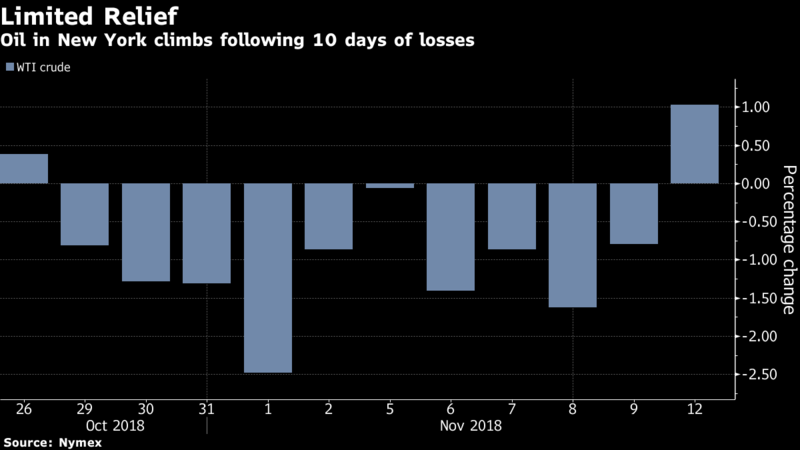 Prices fell for a record 10th day on Friday, while the Cboe/Nymex WTI Volatility Index jumped to the highest level since late 2016. Brent futures for January settlement advanced US$1 to US$71.18 a barrel on the London-based ICE Futures Europe exchange, after falling 47 cents on Friday to a seven-month low. The global benchmark crude traded at a US$10.11 premium to WTI for the same month. The producers need prices that are high enough to balance their budgets and low enough to stimulate demand and shield themselves from attacks from U.S. President Donald Trump. Their caution arises partly from the unpredictability of Iranian supply. The U.S. at first insisted it would seek to curtail all of the country’s exports, only to grant waivers to eight of its customers when Washington reimposed sanctions this month. Other oil-market news BP Chief Executive Officer Bob Dudley said Saudi Arabia’s cut in exports is likely to “firm the price,” in an interview with Bloomberg Television. Vagit Alekperov, CEO of Russian oil producer Lukoil PJSC, said he sees “no need” for output cuts right now and that $70 a barrel suits producers and consumers. U.S. rigs drilling for crude rose by 12 to 886 last week, the largest weekly increase since May, according to data from oilfield-services provider Baker Hughes on Friday.